I hope you are well. 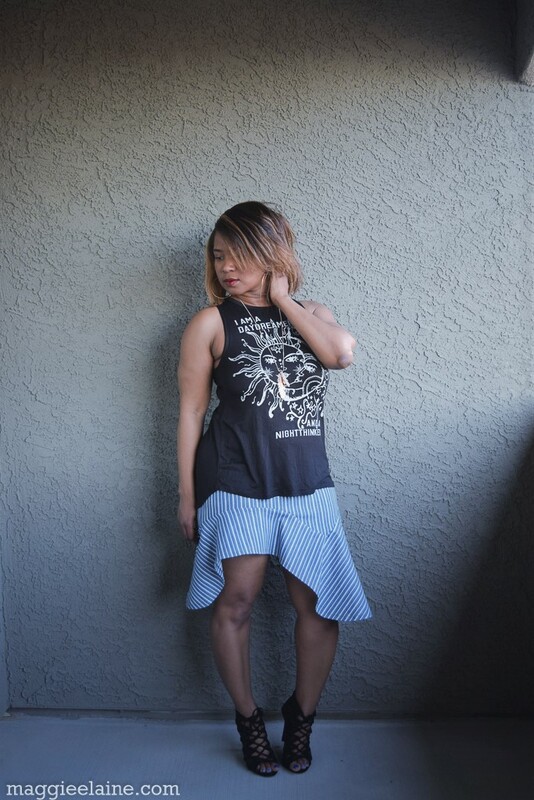 This month for the Skirts Challenge (#sewcoolskirts), I wanted to do a ruffle/flounce skirt. On a whim, I picked up Vogue V1450, because I saw beauty in the skirt design (View B). You almost miss how great the skirt is, if you focus too much on View A, the sleeveless top, on the pattern cover. I think it is a bit overwhelming paired with the skirt (just my opinion). This skirt turned out to be such a fun skirt! To make the skirt, I used this wonderful striped stretch denim from Fabric Mart (click here). This fabric is a dream to sew and wear. It is a combination of cotton and lycra with 10% stretch. So let’s get into a few details on this DIY look! I must say, there is not too much to say about the construction of this skirt. The pattern is labeled as very easy and I have to tell you, it is extremely easy to make. I think any beginner would find joy in making this skirt, especially if you take the route I took and not line the skirt. 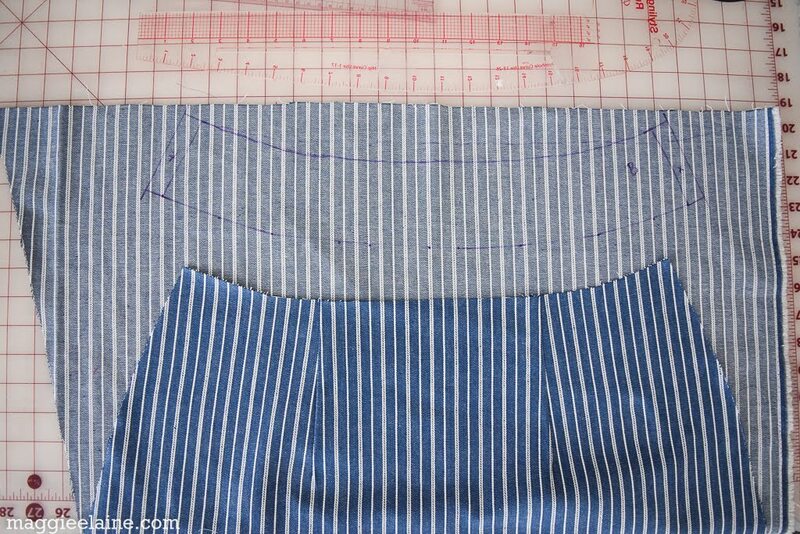 The pattern is designed for a lined skirt, but I hardly ever see the need to line denim. It took four pattern pieces to make this skirt. The front and back pieces are cut on the fold; and I cut one front and one back flounce piece. Since I did not line my skirt, I self-drafted front and back facings. After stitching the darts on the front and back pieces, I traced around the top edge of the two pieces and down 3-inches on each side to create the shape for the facings. 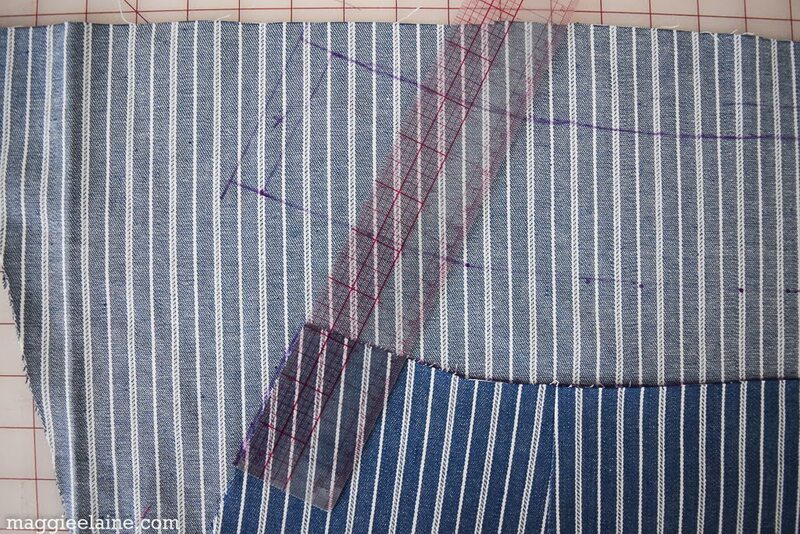 Once I had the shape traced out, I added 5/8 inch seam allowance on each side. This skirt has a side invisible zipper. 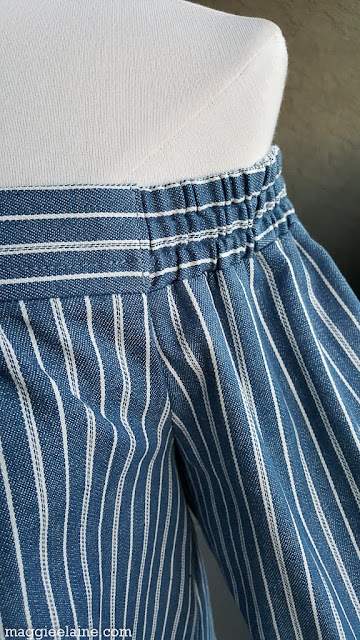 I am not a fan of side zippers and I usually move them to the back; however, I didn't want to fuss with moving it this time. 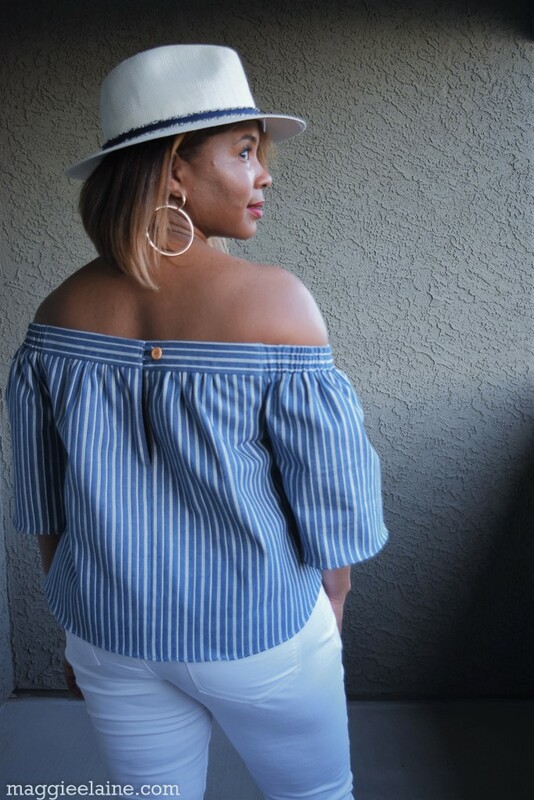 I focused on trying to keep my stripes matched as much as possible in the front and back, but when it came to the flounce and its curves and angles, I had to let the "stripes" fall where they may. This gave the skirt more interest. When hemming a skirt with curves like this, I normally baste around the skirt at the hem line, then fold and press the hem along the stitch. It saves time and makes things much easier. 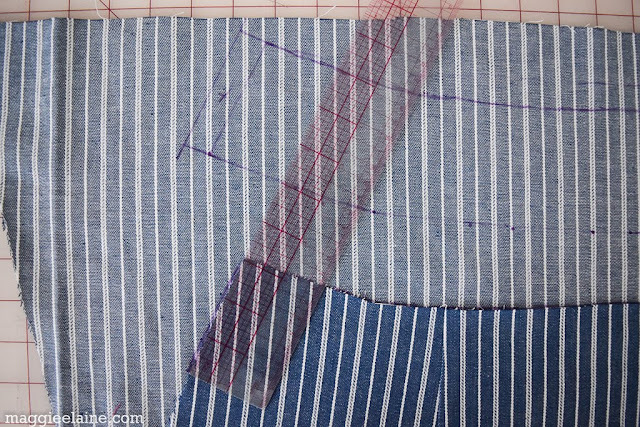 I top-stitched my hem with jeans top-stitching thread. 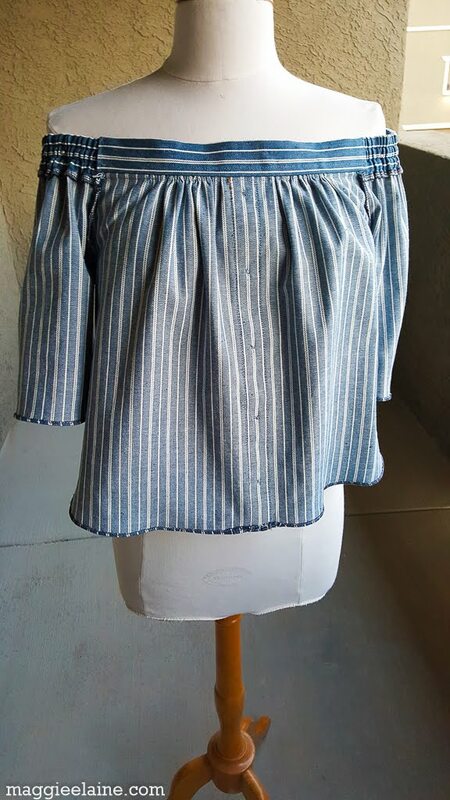 I had more fabric than I expected and since I was enjoying sewing with it so much I made a top with the leftover. I used New Look 6512, and ahhh, this pattern is on my list of favorites. Seriously, I could make this top for every day of the week, the pattern is just that lovely. I have been searching for a pattern like this for awhile. I love that it does not have the elastic around the front and back, but that it is mostly around the shoulders only. The weight of this denim is light enough to make this top. Now I wasn’t 100% sure that I was making the top to go along with the skirt, but I figured why not take pics in both pieces together just to see what it looks like. 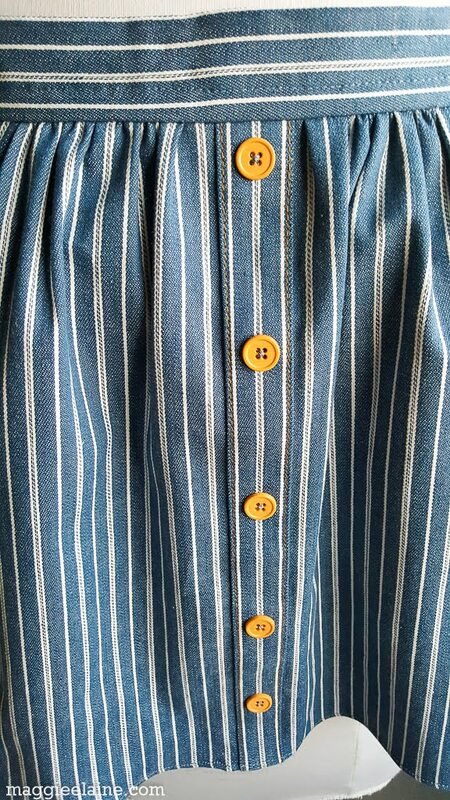 Now the placket and buttons in the front are for beauty only, they are not functional. I used jeans top-stitching thread along side the placket. I love the color of the buttons with this denim! I played around with the direction of the stripes to give the top more interest. 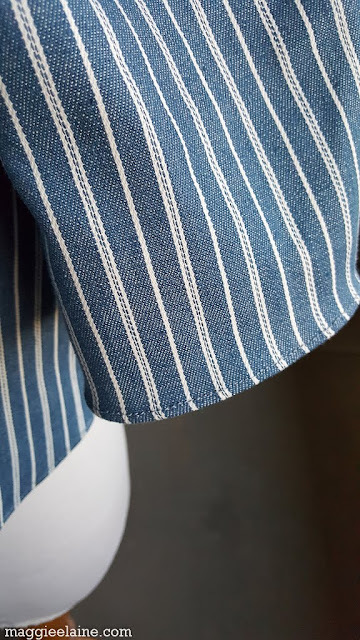 I hemmed the sleeves and the top with a narrow hem. The elastic casing is made by stitching at 1/2-inch from the edge, and then 1-inch from the edge. Three elastic strips are inserted in the casings on each side. 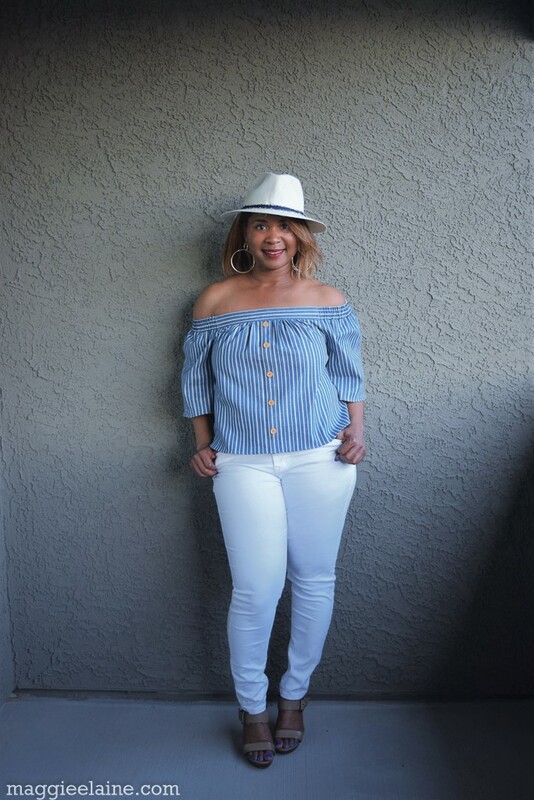 I styled the top with my new favorite pair of RTW white pants, that I also wish I could wear everyday (do you know how hard it is to find a great pair of white pants, lol?) This hat makes me feel like I am on vacation. I hope you enjoyed these two DIYs! Until next time take care! 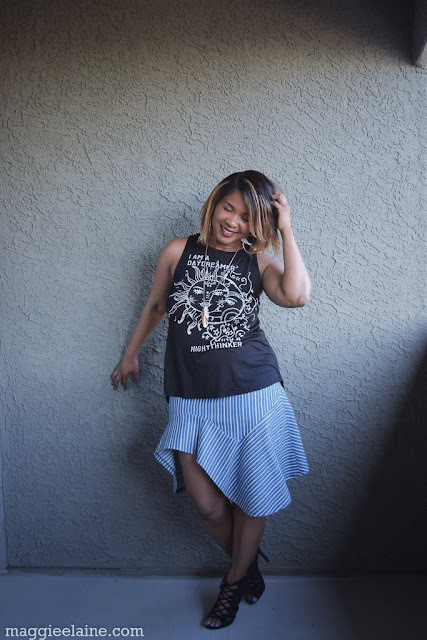 Share your me-made skirts thru May 31st and be entered to win a $50 gift certificate to Fabric Mart! Share on Facebook or Instagram using #sewcoolskirts. And you made it clear that the pieces are pretty versatile. Nice work! Thanks Tasha! Yes, so many styling possibilities. Love that skirt and top. The denim fabric really makes both pieces a standout. Thanks Robin! 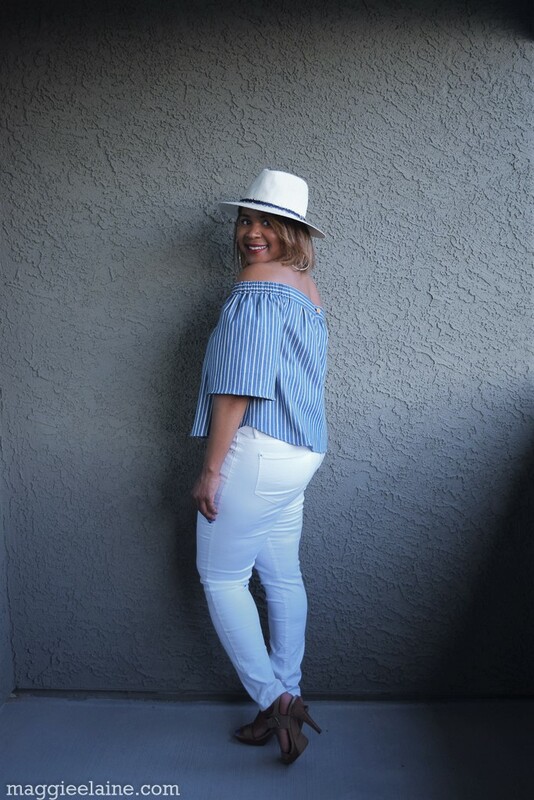 Really a fun twist on denim! I love these two pieces together! They are amazing and I love the denim choice! Thanks Lora! Yes great summer projects! 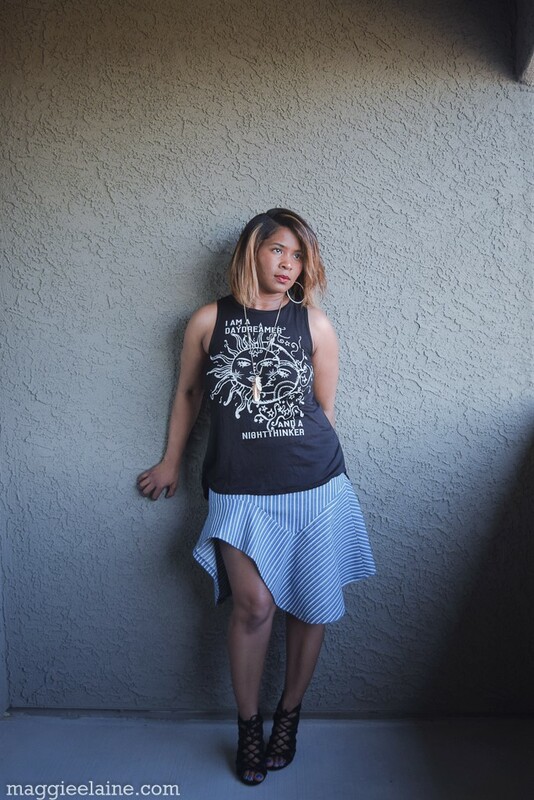 I think you are right about the V1450 top with the skirt. Too structured and boxy for that lovely skirt. On the skirt, do you think it could be successfully lengthened, maybe under the darts? I have two foot long scares on my left knee and don't want to call attention to it, but this skirt is beautiful. 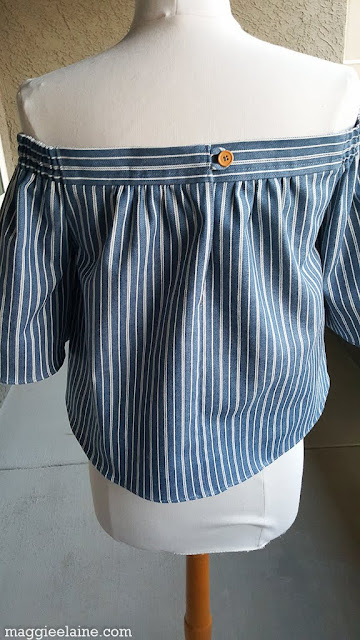 Love the use of denium - great fabric choice! Thanks Meg! Yes, I think it would be easy to lengthen the skirt under the darts. I would probably slice the pattern a little under the dart lines and insert paper according to the length you desire. Then re-attach/tape the curvy bottom of the pattern back on the paper. Keep in mind that one side is a lot longer than the other side once you add the flounce pieces, so be sure not to lengthen it too much. Then fit the sides to skim your figure the way you prefer. I think this skirt would look super cute in a longer length too! I love the top especially!!!! 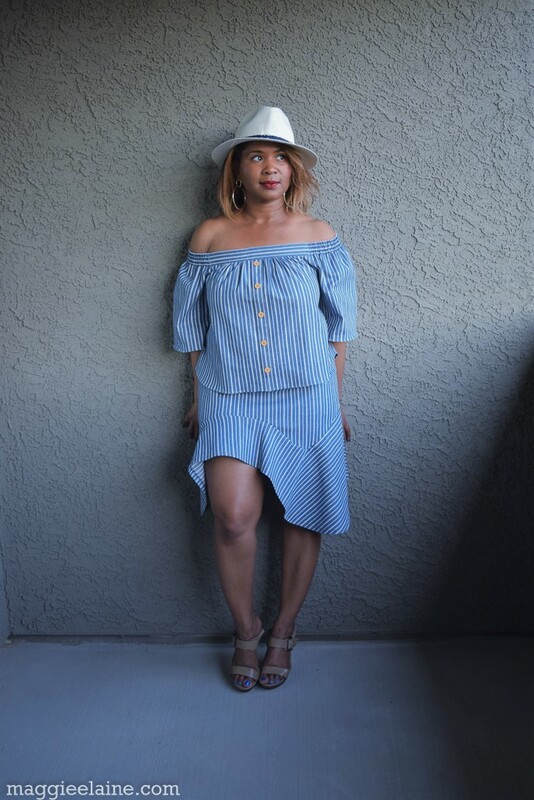 Super cute outfits and a great fabric! Thanks KS! It feels great when projects turn out better than you expected! wow, VERY nice! 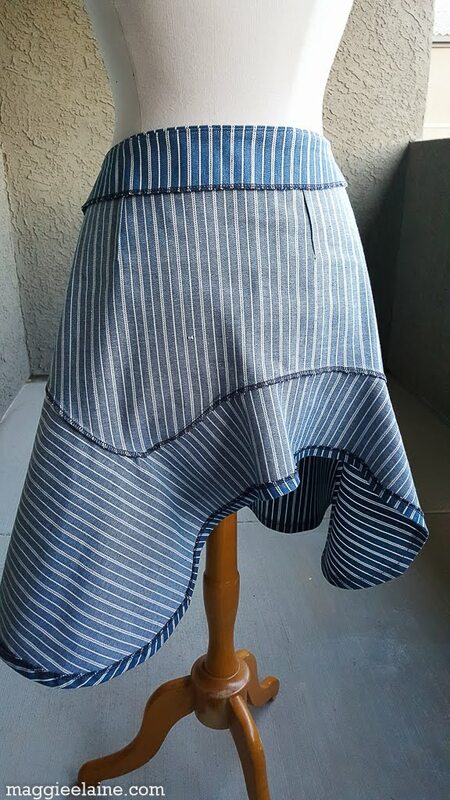 I wasn't sure I liked the skirt at first, but the more I looked at how the stripes went the more I did. And THEN, you showed the skirt and top together, what a great outfit!!! love the detail on the back of the top. GREAT job. 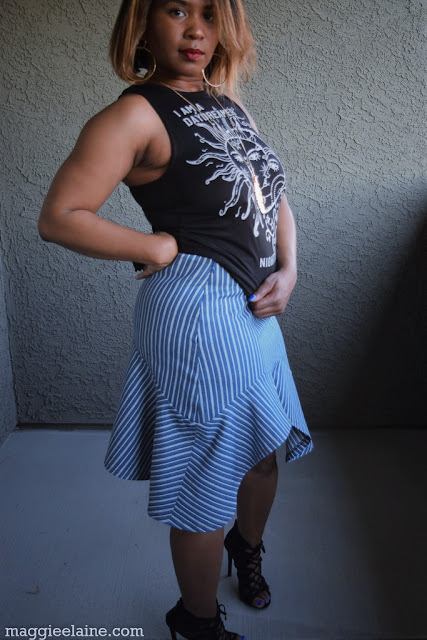 Skirt Challenge: Selene for Travel!